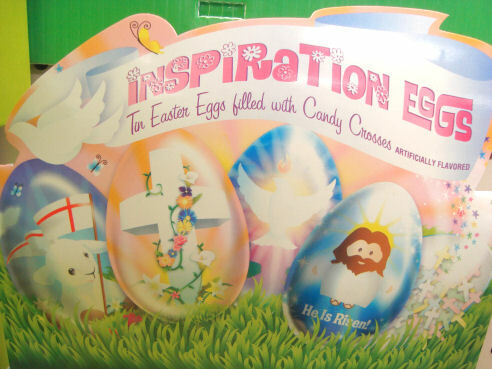 For those of you looking for more meaning on Easter Sunday than telling your kids about a fictional giant bunny that delivers candy, here are some religious Easter basket stuffing ideas that won’t break the bank. Of course your local Catholic Shop or Christian Bookstore will have some cute religious stuff that would be great for Easter basket stuffing, but that’s not always a financial option for me. 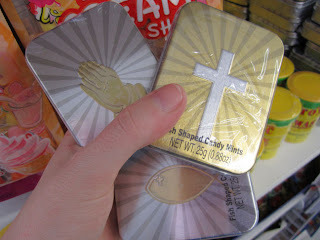 My favorite place to shop for cheap religious stuff is at the Dollar Tree. Check out the cheap and religious Easter basket stuffers I found at my local Dollar Tree! (Note that products can vary from store to store, although they seem to largely carry the same things. It depends on what was ordered for that particular store, so the bigger your Dollar Tree the better your chances of finding a wider selection of things). Check out these chocolate crosses! pink or blue, and plunk one of these babies right on top! 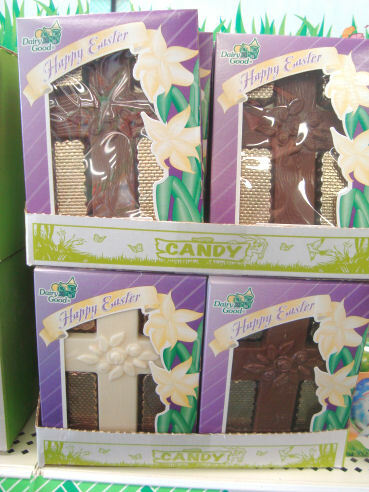 Also find chocolate praying hands and smaller crosses. (I also saw these at Giant grocery store). inside of these are shaped like little fish! Most exciting find- Catholic stickers at the Dollar Tree! Some stores have ’em, others don’t, but if yours does, stock up! what you’re looking at. They’ll be with the Easter stuff. religious Easter basket stuffer for $1 each. Or even 2 for $1! In fact, my Dollar Tree had a whole end cap display of religious and biblical stuff that was right in the Easter section, obviously meant for basket stuffing. You can also get fake flowers galore! 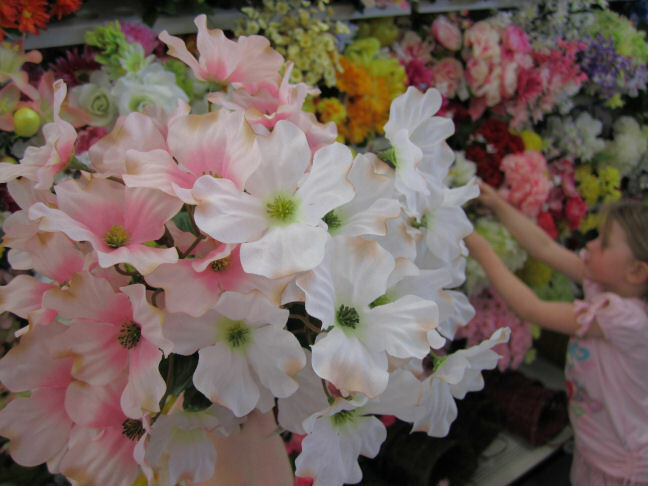 Ever heard the Easter legend of the dogwood tree? Michael’s actually had tons of wooden crosses for crafting. They also had several religious Easter books for children. They ranged from about $5-10 each. Also, don’t forget about the internet as a resource for free or cheap stuff! 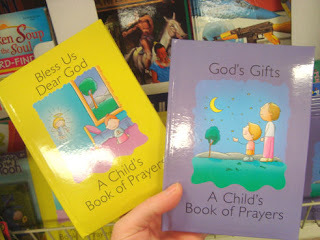 You can print free prayer cards, books, coloring pages- all kinds of stuff! Here’s a cool Catholic Easter basket stuffer- have ya’ll seen these rosary eggs? My mother-in-law introduced me to these, and they’re adorable! The rosaries are quite tiny (the eggs are only about half the size of normal eggs). Sometimes you can get them from Catholic shops, but you can totally order them online for only $0.75 each, and you can pick your colors! Religious cookies also rock, and I’m willing to bet you already have a cross shaped cookie cutter , and an angel, too! 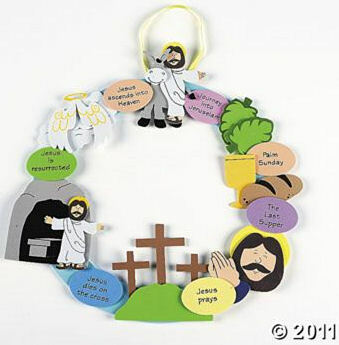 Another great place to bulk order religious stuff (including craft kits) is from oriental trading. 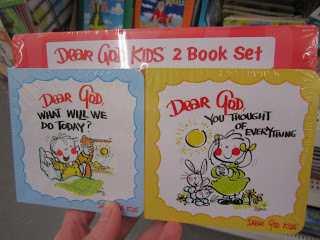 They have some seriously cute and affordable religious stuff for kids! Hope ya’ll enjoyed “window shopping” from your computer chairs today! Lacey, you have some great ideas here! Just wish our Dollar Tree carried those stickers. I've checked three different stores and no luck! Last year, I printed out the "Bible Friends" paper dolls from the makingfriends.com website for my daughter's Easter basket. We printed them on magnet sheets and she plays with them on a cookie sheet or the refrigerator. Ohh, thanks for all the tips, I always forget about Dollar Tree! A couple more suggestions: last year I got my daughter a Bible Stories coloring book at Walmart that even has pages for the Our Father and Hail Mary, and have often gotten Veggie Tales DVD's in their $5 movie bins. Great post, thank you! I can't wait to go shopping now. I found some cute Veggie Tales themed chocolates at Rite Aid for 88cents. 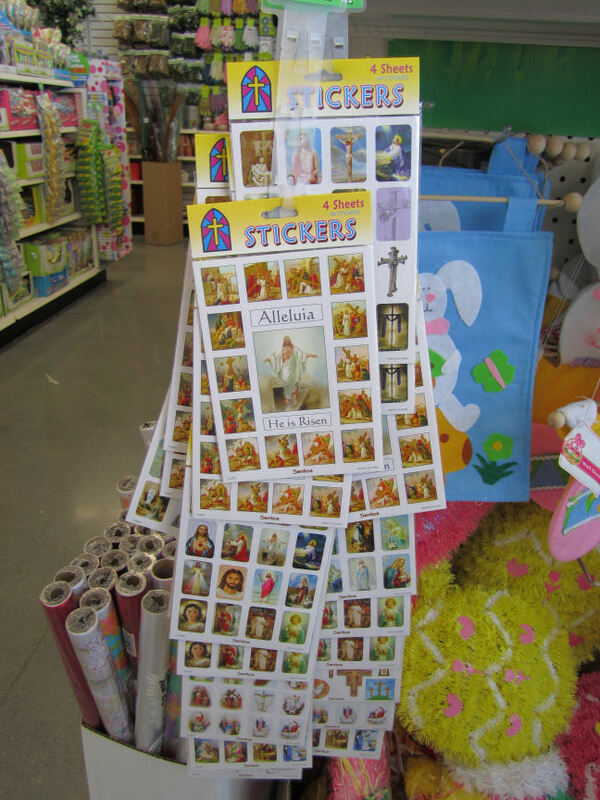 My Dollar Tree had the stations stickers last year but I didn't know to look for the rosary and Lent ones…. Maybe they'll have them when I go this afternoon! Thanks for the great suggestions! I was just thinking about how hard it is to find good religious Easter stuff for baskets! Great finds! I will definitely be checking out the stickers and prayer books. 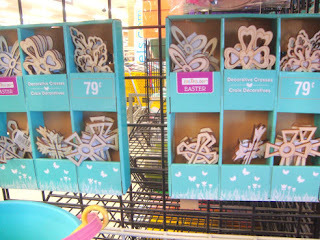 Just wanted to let your readers know that not all of the Dollar Trees have the Catholic sticker with the Easter stuff. Our had them on an endcap at the back of the store, near the toys and stationary…. I was so happy when I found them; I think I bought 6 packages, and am thinking of going back for more!! I was on Skype with my husband (because he's in Iraq) and he told me, "You need to go to the store and stock up on those sticker and books, because they'll last until we have kids!" 🙂 I thank God that I married an atheist who turned Christian on his own and now loves the Catholic faith even more than I do at times! He completely supports making holidays Christ-centered. I think bunnies are excellent (in fact it's my husband's nickname from me, so we have a lot of them for Easter), but I think it's important to keep the kids knowing what Easter is all about, and that isn't a large creepy bunny costume! Thank you for this great post. 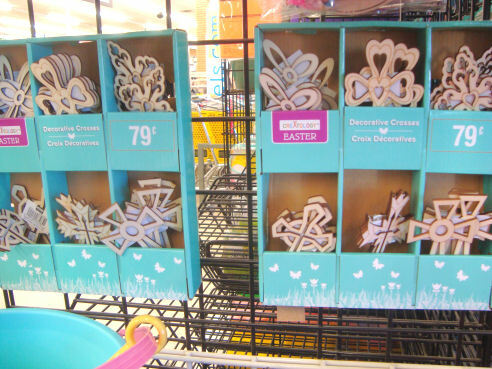 Just today my husband and I were talking about Easter baskets so I'll be sure to head on in to Dollar Tree for some great finds. I have another idea for the white chocolate crosses. I'm planning on buying a load for First Communicants this year, but since the box says Happy Easter I'll take them out of the box and place in a cellophane bag, tie with ribbon and a holy card and hand out as gifts. What a great religious gift that the kids will use(eat). 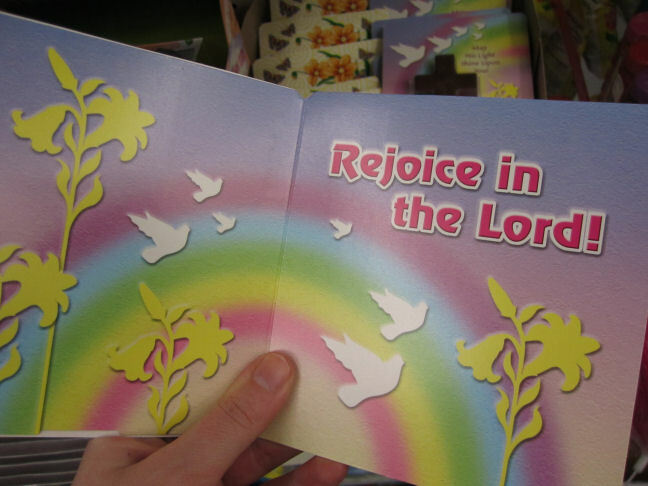 Our Dollar Tree had the stickers too, but not with the Easter things. They were in the back, hanging on an endcap. Well, actually, I got them straight out of the box, before the clerk had a chance to put them out, lol. I've a question for you, ladies. Do you ever worry about buying food products from Dollar Tree? I don't normally do that–if I don't know the brand name–because of all the problems with out-of-the-country items. Am I worrying too much? Thank you so much for this tip. 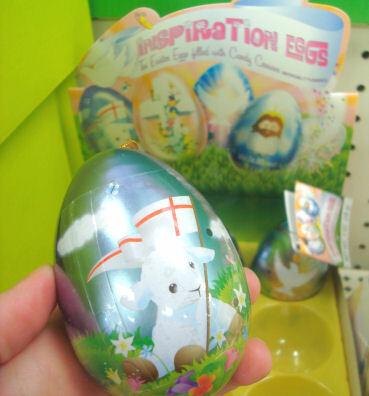 I just went to the dollar tree earlier today, and found the crosses and the praying hands and the inspiration eggs. Too bad that the Jesus ones were gone, but I got the Holy Spirit and the Lamb of God eggs for my boys. 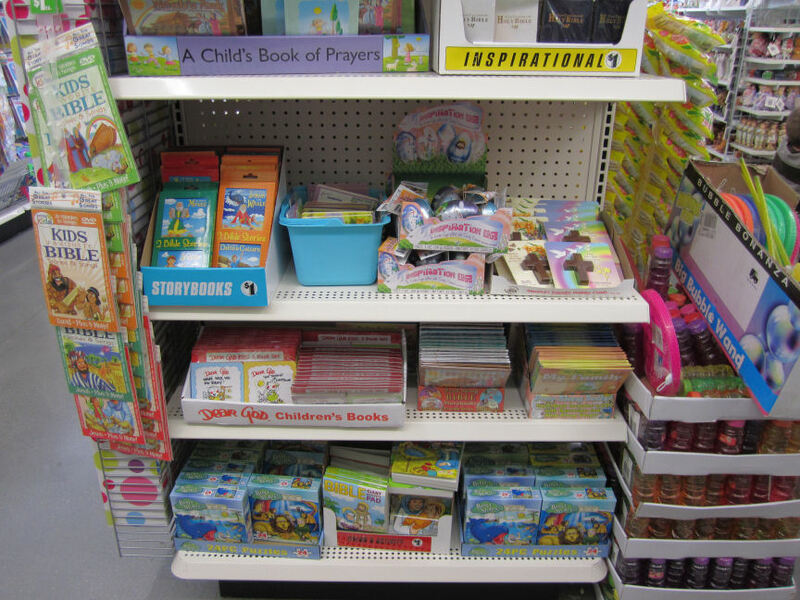 Dollar Tree also regularly has bible colouring or activity books. Lacy, you're so awesome. what would I do without your great ideas and inspiration! you have a much better dollar tree than I do though. we have nothing religious as our dollar tree. 🙁 But I will definitely check out Michael's for those crosses. THANKS! I'm the director of a Sunday School and after reading your post I dashed to the Dollar Tree and went crazy. Can you believe that they were already sold out of the "religious eggs" but I stocked up on other items. The Dollar Tree store is a great tip. Trips to three different Dollar Trees finally yielded the stickers – great find! I bought a lot of them today! Thank you! You have great dollar stores in VA! Nothing like that in the ones I've been to up here in MA. Looking all over the place for my CCD students who will receive their First Reconciliation Saturday and First Communion next month. Love reading all your great ideas, thanks for sharing Lacy. Thanks, Lacy! 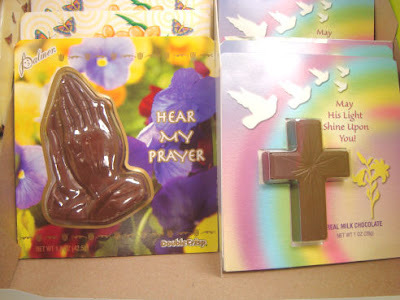 Those crosses and praying chocolate crisp hands from Dollar Tree have become a tradition in my house. I just picked 3 up for another friend last week, as well. 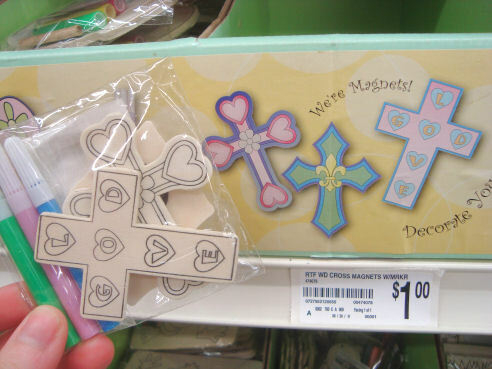 I just wish my Dollar Tree still carried those religious stickers! We had them here last year, and I SO loved them! Amazing that you found so much at the dollarstore and Michaels. 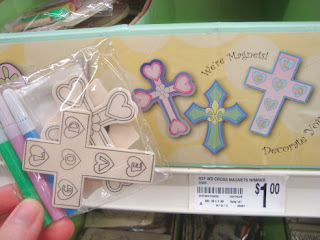 I couldn’t find any nativity craft items at Michaels at Christmas, and was very disappointed. I was listening to 1310AM radio the other day and they mentioned Rainbow Resurrection Rolls and the Catholic Icing.com website would have the recipe but I haven’t located it yet. could someone point it out where the location is for me please?